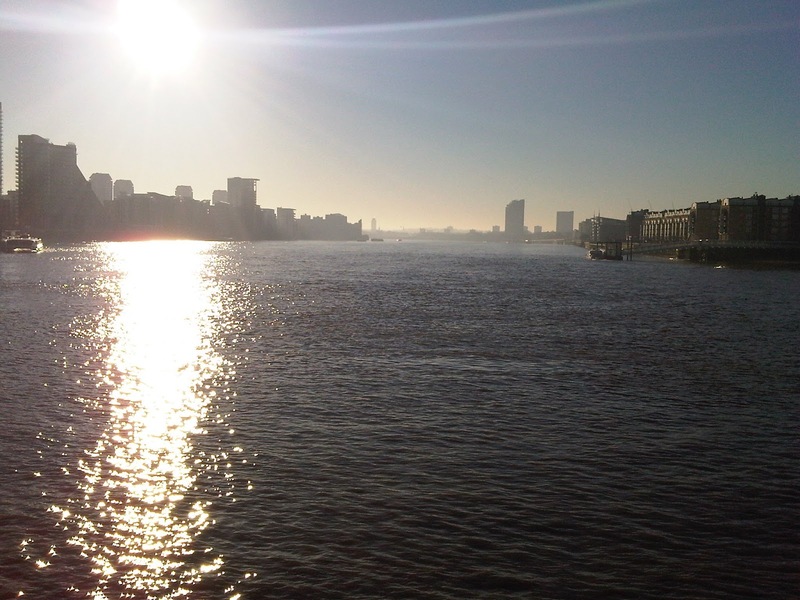 Living near the River Thames I’m often struck by the fact it is so empty these days. It was much busier when I was a child, so the decline in river traffic is a fairly recent phenomenon. 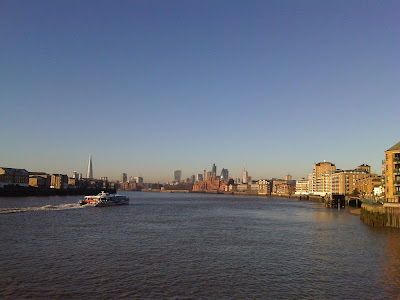 I suspect the Thames hasn’t been so quiet in centuries. 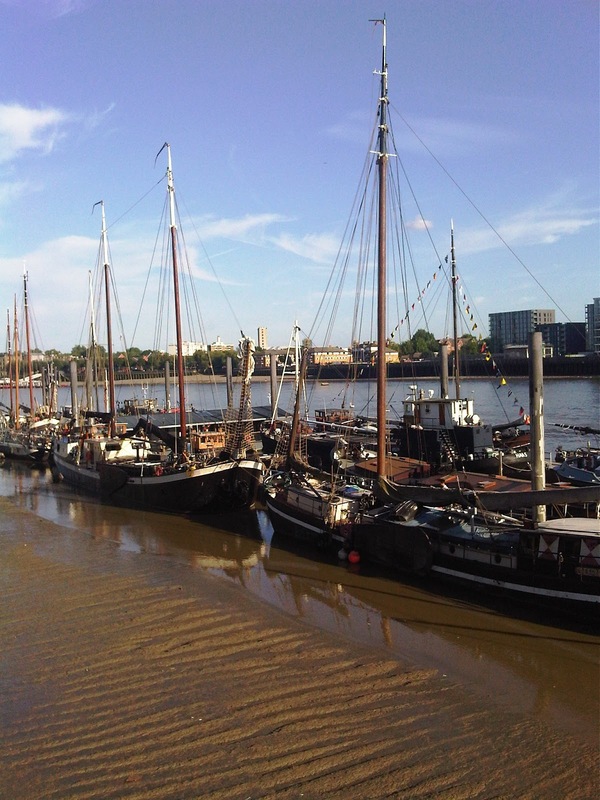 Photographs and old newsreels from the last century show it teeming with all sorts of vessels, from great ships, powerful tugs, and the lovely distinctive Thames sailing barges, down to small skiffs and tenders. Today the river traffic is mostly tourist party boats, the fast commuter clippers, and the even speedier rib boat rides. 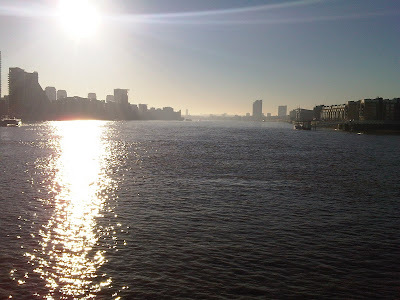 But the Thames is still a “working river” – tug boats still haul barges filled with the city’s waste down river, and at high tide large cruise ships occasionally make their incongruous way upstream to moor alongside HMS Belfast. 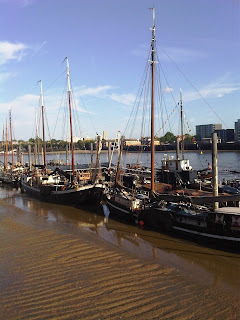 Sometimes, sitting near a window in my flat, catching a glimpse of one of these out of the corner of my eye as it passes by can be quite disconcerting; as, masked by the riverfront buildings, these ships look like a tower block that has decided to up sticks and slink off through the city. 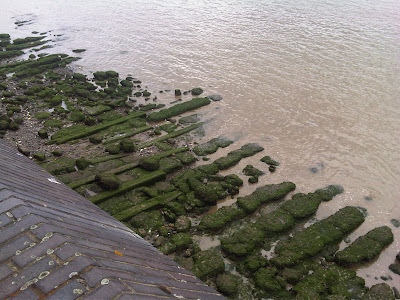 These happenings are made all the more eerie because their massive engines are so silent, yet the powerful vibrations of their screws turning in the comparatively shallow channel of the riverbed manage to rattle all the cutlery in my kitchen drawers. 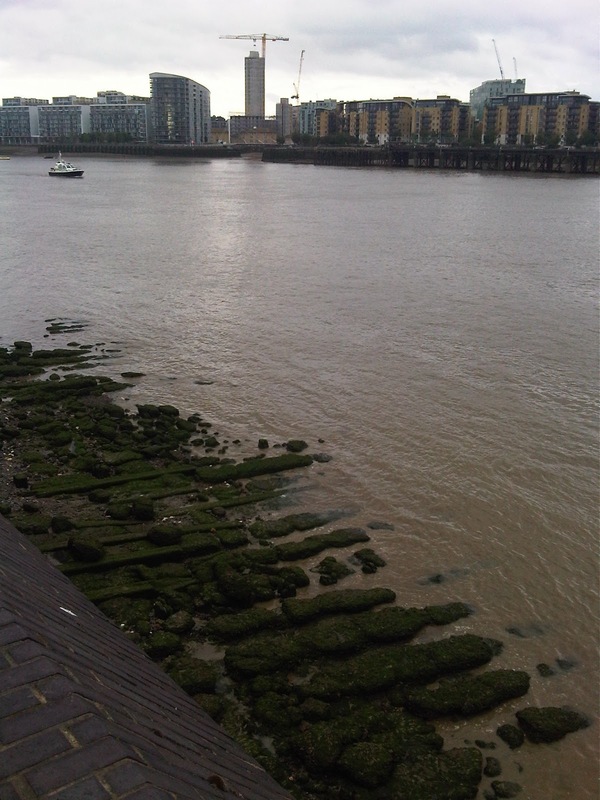 It’s impossible to live by the river and not become fascinated by its history. In the narrow maze of riverside streets, many of which are still cobbled, you can find echoes of the past. 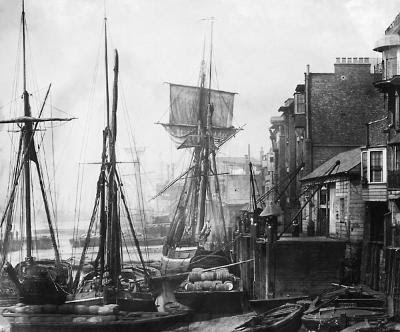 Old signs; converted warehouses and disused pumping stations; old docks and inlets; waterman’s steps; and cosy old pubs, such as the Prospect of Whitby or the Town of Ramsgate, that have been in business for hundreds of years. Then there’s the ever changing weather and the regular rise and fall of the tides. 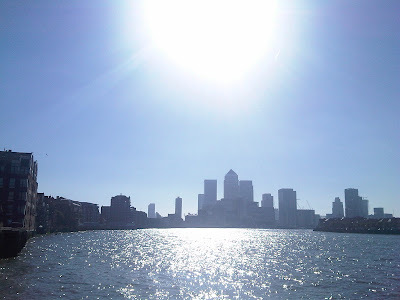 It often feels like the river has its own micro-climate which is distinct from the rest of the city, as here a mile’s distance can make all the difference between rain and shine. Sadly a workman in the Napier shipyard was accidentally killed during the failed launch. When the crowds did eventually disperse I can’t help wondering if Dickens stopped by at The Grapes on nearby Narrow Street, a favourite haunt of his (and mine) on which he is said to have based his description of "The Six Jolly Fellowship Porters" inn in Our Mutual Friend (1865). 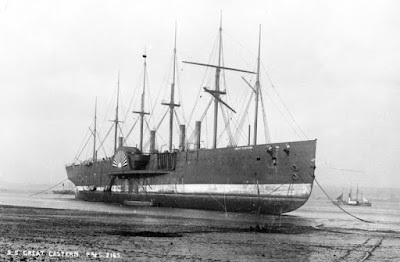 The original steam powered rams were not strong enough to push the ship down the timbers, and so, with the use of hydraulic rams and a conveniently higher tide than usual the ship was eventually launched sideways into the river as planned on January 31st 1858. “In the Atlantic Cable, the fabulous ‘Great Eastern’ met her destiny and at last achieved the triumph which she had so long been denied. This magnificent but unlucky ship had been launched seven years before, but had never been a commercial success. This was partly due to the stupidity of her owners, partly to the machinations of John Scott Russell, her brilliant but unscrupulous builder, and partly to sheer accidents of storm and sea. Seven hundred feet long, with a displacement of 32,000 tons, the ‘Great Eastern’ was not exceeded in size until the ‘Lusitania’ was launched in 1906, forty-eight years later. 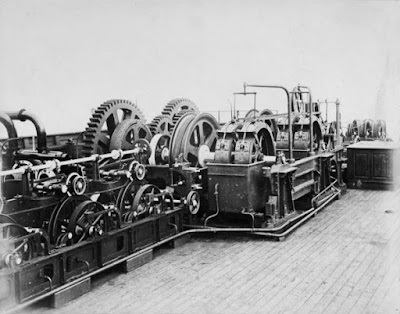 She was the brain-child of Isambard Kingdom Brunel, the greatest engineering genius of the Victorian era – perhaps, indeed, the only man in the last 500 years to come within hailing distance of Leonardo da Vinci. […] He was as much an artist as an engineer, and the remorseless specialisation that has taken place since his day makes it impossible that any one man will ever again match the range of his achievements. Of these, the ‘Great Eastern’ was his last and mightiest. 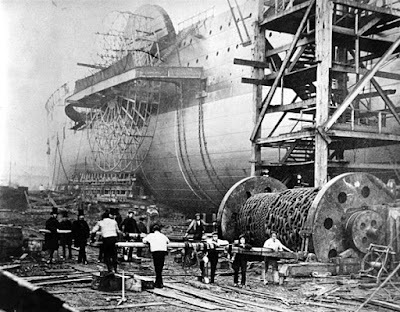 Though she was five times the size of any other ship in the world, she was no mere example – as some have suggested – of engineering megalomania. 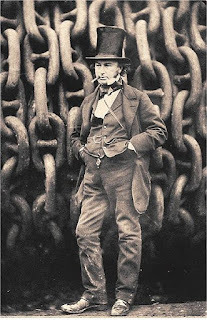 Brunel was the first man to grasp the fact that the larger a ship, the more efficient she can be, because carrying capacity increases at a more rapid rate than the power needed to drive the hull through the water (the first depending on the cube of the linear dimensions, the second only on the square). 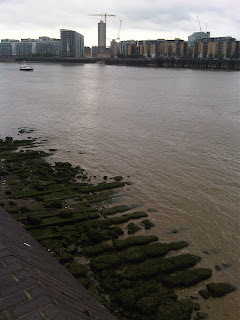 Having realised this, Brunel then had the courage to follow the mathematics to its logical conclusion, and designed a ship that would be large enough to carry enough coal for the round trip to Australia. Presumably the majority of the animal 'class' of passenger didn’t make it all the way to Newfoundland. 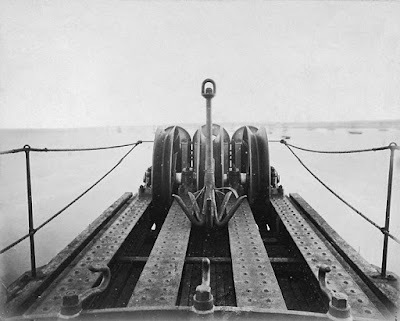 After the successful laying of the transatlantic cable the Great Eastern went on to lay over 30,000 miles of undersea telegraph cables, including one across the Arabian Sea from Yemen to India. the life of wind on water. 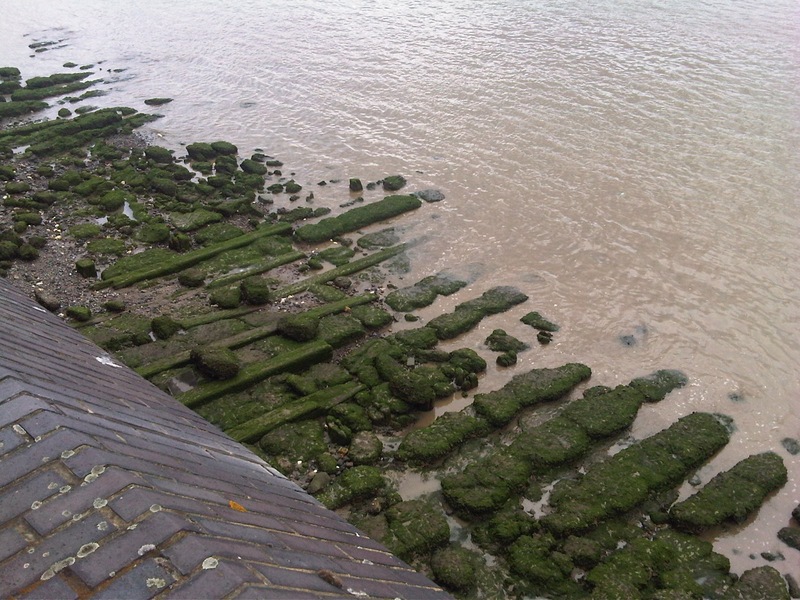 It’s strange to think that the wooden timbers of the Napier shipyard have outlasted all of it – the shipyard, the great ship, and even the Thames shipbuilding industry itself. Looking at that field of timbers in their serried ranks, and then casting your eye out over the stretch of water alongside, it’s easy to picture the Great Eastern, that majestic old ship (the prototype of those massive cruise liners which occasionally chunter up and down this improbable channel), a visionary leviathan, long laboured into being, eventually setting out from here to change our world forever. In many respects she is the first true ghost of our modernity, and this is the very visible spot where she was born. All colour photographs were taken by me; click on the image for the source of the B&W archive photographs.